If you want to send someone a personalized message using your own Handwriting, then it is easily possible for Android devices. You just install a free app called "InstaFontMaker Font Maker Free" from the Play Store. Next, you discover how easy it is to create your own fonts. Your handwriting will be a new font for you to use. By creating your own font, you have something personal and unique. Using the touch screen interface of your device, you can input all the English alphabets and some signs like comma(,), exclamation mark(!) etc. You will have to input 83 different characters correctly. You do this as if you are writing on paper but instead you drag your finger across the screen of your phone. There will be guides on the screen to tell you what to write and how big the written character should be. Just follow it for all the 83 characters and you are done. After clicking on finish, wait a while till all the glyphs are generated. Next, you can customize the width and the spacing between two characters. After finalizing everything, you are good to go. 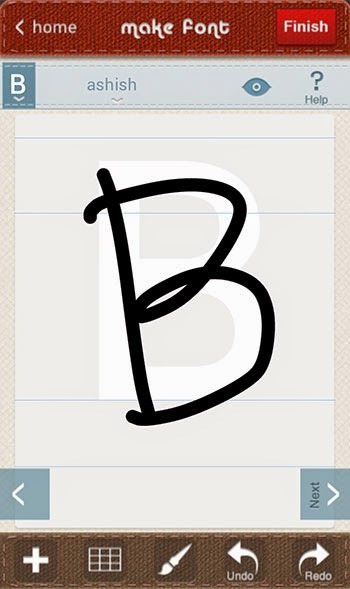 You can write with the newly created handwriting font on the InstaFontMaker app. You cannot use the font directly in other apps or in your phone. However, you get tons of sharing options that allows you to convert your hand written texts into pictures before sharing. This ensures that your personal font is visible for others as well. You can also add additional eye-candy like background, images, text-color, photos etc. The generated output can be shared using Android's native sharing feature. That means the picture can be shared using messaging apps like viber or in social networks like Facebook. Here is the screenshot of a sample text that I wrote in my own handwriting. I know it is not the best handwriting in the world but it looks quite personalized, at least for me. You can create something much better. If you are not a big fan of your own handwriting, then you can check out the trending feature of this app to find other cool handwriting fonts by other people.